I took all of last week off from work because my father was in town. We went camping in Yosemite (more on that later) and then to our friends' farm. As always, they were super generous with both their time and their produce. I took home a few boxes of fruit and veggies, a dozen eggs from their chickens, a loaf of homemade bread, and more. Bonanza. The tomatoes, they overfloweth. 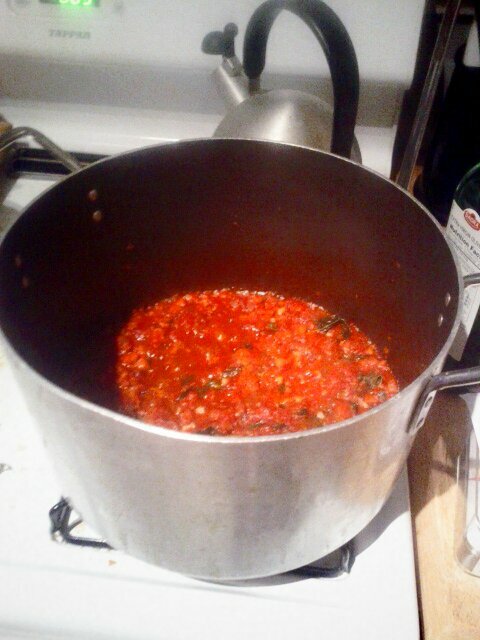 So last night I made sauce from scratch, using some of the bigger and more beat up tomatoes. I used Smitten Kitchen's recipe as a guide. You may be able to see that there is a serious amount of basil in the sauce (garlic too, but that is maybe not so visible). That is because Katie and Larry also gave us 5+ bunches of their basil, including some cool varieties like lemon, lime, and cinnamon basil. They smell and taste exactly like they sound - which is lemony/limey/cinnamony basil goodness. The plain basil went into the sauce, and the lemon and lime basil went into a pesto, which I made with pecans, since that was the only nut I had on hand. Copious amounts of their garlic went in as well. No pics of the pesto, but it looks exactly like all other pestos, even if it tastes a bit different. There were some tomatoes that were too beautiful to put into the sauce, so I made a tomato tart roughly based on David Leibovitz's. 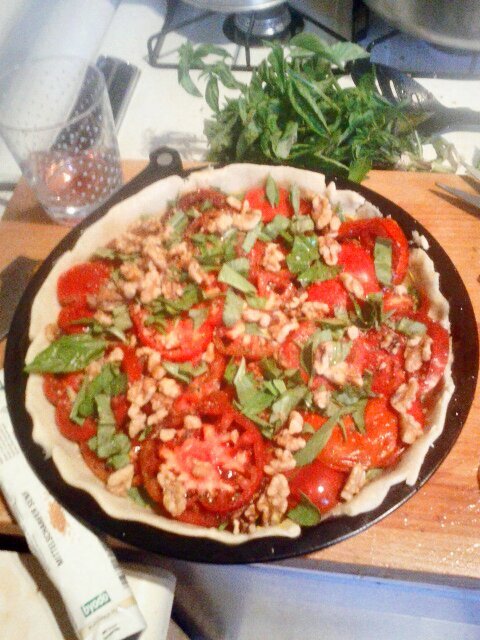 I used another head of basil to line the crust (a Trader Joe's crust, because anything involving butter scares me) and to scatter throughout the layers. I also threw in some crushed walnuts, both because I had them leftover from our camping trip (victims of getting packed into the bear canister) and because they are amazing in combination with tomatoes and cheese. Throw them on pizza next time you make it at home - you will not be sorry. Here's the sucker before the final layer went on. 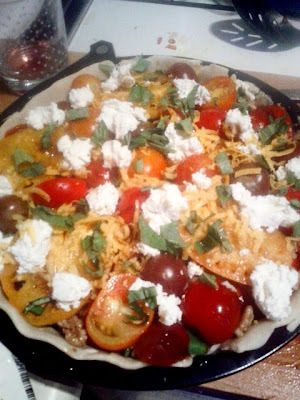 I topped the tart witha bit of grated cheddar, some cherry tomatoes, and big dollops of Katie's goat cheese. Her goats are producing more than she can handle, so she's been making cheese out the wazoo. This cheese was chevre-like, and super tasty. Per David Leibovitz, I attempted to drizzle honey on top, but mine is local and a bit goopy and it plopped more than it drizzled. While the tart baked and the sauce bubbled, I had my actual dinner - because of course at this point it was after 9 p.m. and I was hungry. 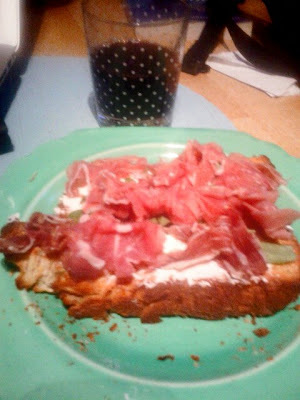 I toasted Katie's dad's onion-dill bread, spread the chevre on it, and topped it with basil and prosciutto (left over from a restaurant meal - I don't generally buy meat for use at home). With a glass of red wine, it was perfect. Not that I didn't have a bit of the tart when it came out of the oven. 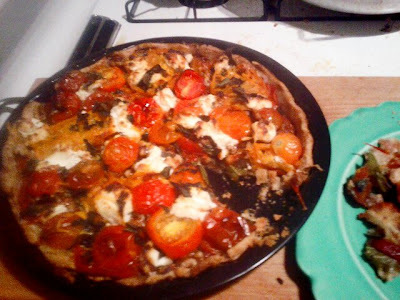 It was super tasty, and I have it all to myself since Mike is a) not that into tomatoes and b) trying to pinpoint an allergy by abstaining from dairy this month. So if you are in the neighborhood, please come by and have some tomato tart with me. Oh my god! Amazing! Can I please? Do you think it will still exist by the weekend? I'm sure it will be - I can't tackle it myself. And it doesn't seem like it would freeze well. So yes please, help me.